Please include attribution to www.humorthatworks.com with this graphic. 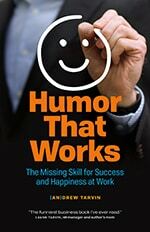 The benefits of humor at work have been touted since the early 90’s, and yet only 1/3rd of workers use it consistently. Here’s why you should use humor in the workplace. Humor is defined as: a comic, absurd, or incongruous quality causing amusement. Humor at work isn’t about making work funny, it’s about making work fun. Affiliative – Amusing others as a way to facilitate relationships. Self-Enhancing – Finding amusement in life’s hardships and staying positive. Self-Defeating – Saying funny things at one’s own expense. *Not really appropriate for the workplace. Add a humor section to your newsletter. Take an improv class together. Find even more ways to use humor in the best-selling book / app, 501 Ways to Use Humor at Work. Or sign up for my monthly humor at work newsletter. The Science of Workplace Happiness, US News. Humor Therapy: Relieving Chronic Pain and Enhancing Happiness for Older Adults by Mimi M.Y. Tse. Journal of Aging Research. Volume 2010. Humor in the Workplace: Anecdotal Evidence Suggests Connection to Employee Performance by Lauren Breeze. Perspectives in Business, St Edwards University, 2004. Inside Joke: Humor Can Help the Bottom Line. Dana Wilkie. Society for HR Management. October 2013.